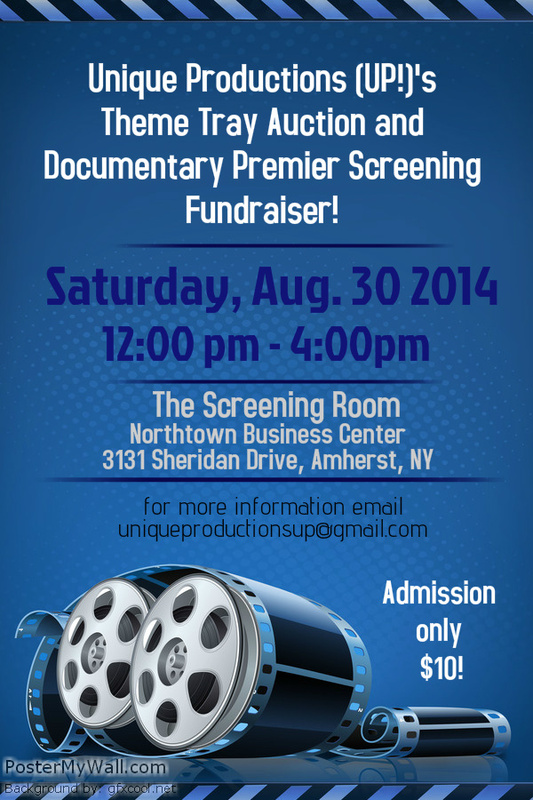 UP!’s Theme Tray Auction and Documentary Premiere Screening – August 30, 2014; 12pm – 4pm! You can buy event tickets ($10 per person!) through an UP! Cast member, by emailing UP! at uniqueproductionsup@gmail.com, call/text UP! (716) 243-8889, by visiting http://uniqueproductionsao.brownpapertickets.com/ , or at the door on the day of the event. Hope to see you there!!! Previous Previous post: UNIQUE PRODUCTIONS UP!Coming Events – Auditions, Documentary Screening, Open Mic, & Writing Group, Oh My! Next Next post: Need to Get in Touch with UP!? Contact Us Using Our Shiny New Phone Number! !